WASHINGTON (Sputnik) - The United States’ guided missile destroyer McCampbell entered the Sea of Japan to challenge Russia's maritime claims in the area, US Navy spokesperson Rachel McMarr said in a statement. "McCampbell sailed in the vicinity of Peter the Great Bay to challenge Russia's excessive maritime claims and uphold the rights, freedoms and lawful uses of the sea enjoyed by the United States and other nations," McMarr said on Wednesday. However, McMarr pointed out that the move is not against Russia or other countries, and is not linked to the recent incident in Kerch Strait when Russia detained three Ukrainian naval vessels that entered its territorial waters in violation of international law. Peter the Great Bay is the largest part of the Sea of Japan and is also home of Russia’s Pacific Fleet. McMarr explained the United States will fly, sail and operate wherever international law allows it to do so. "That is true in the Sea of Japan as in other places around the globe," McMarr said. 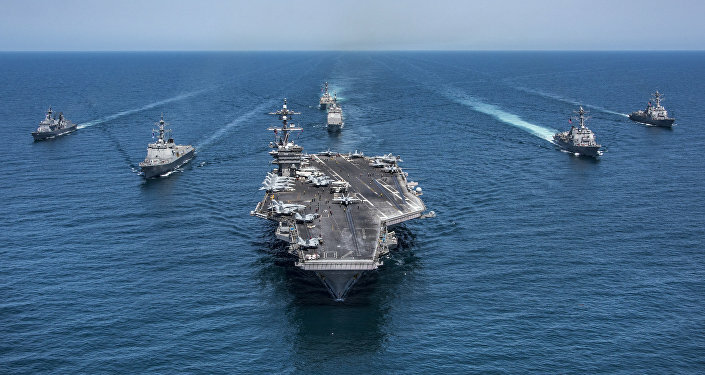 According the US Navy, the Unites States does not recognize Russia's climes on the waters in that part of the Sea of Japan and considers the area international territory because it lays more than 12 miles from Russia's coastline. The United States stated earlier it supports Ukraine in the naval incident in the Kerch Strait that occurred late last month. On November 25, three Ukrainian Navy ships — Berdyansk, Nikopol and Yany Kapu — breached Russia’s water border and began moving toward the Kerch Strait, which serves as an entrance into the Sea of Azov. The Russian authorities detained the ships and their crews after failing to respond to the lawful demands to stop.